After far too long back in California, we decided to finally take a trip we'd talked about for a long time - a trip down the wedding aisle. 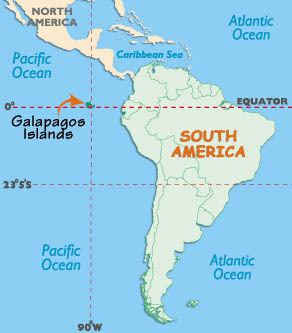 After some debate about how and where, we settled on starting our next adventure in Ecuador's Galapagos Islands. We found a nice looking sailboat, the MV Alta, that would be our home for a week of scuba diving. About 6 weeks before our trip, we got a call from our booking agent saying "not to worry, it'll all be worked out". Our boat had hit a reef and was grounded off Santa Cruz Island. But the company was refitting the 100' trimaran sailboat Lammer Law to take its place in time for our trip. The next call came just 3 weeks before our flight. The Alta finally sank and the Ecudoran government refused park entry to the new boat. So now we had no boat and not too many options for booking so close to our trip. Somehow, we actually had a tentative booking on another boat that we had initially talked to. We'll never really know how we got on the boat, but all that mattered was our vacation was back on! To keep it exciting, the boat was a week earlier than our plans, so there was a week of panic to change work and flight schedules to make it happen. After all that, we needed the vacation more than ever! The real trip started with a brief stop in Quito with just enough time to wander the Old Town, find good ice cream near Plaza de la Independencia and rise to the highest points around the city to view the incredibly sprawling city. Quito truly has no end in sight. The -real- vacation kicked in on Isla San Cristobal, where we met our dive boat, the MV Deep Blue. For the next 7 days, we enjoyed the best of the Galapagos underwater and got to see some of the interesting geology and topside critters. We've had some good diving in our past, but nothing prepared us for the excitement of the hammerhead schools and constant whalesharks of Darwin and Wolf islands. And after a morning of swimming with the sharks, we tied the knot in front of Darwin's Arch. The Deep Blue left us back in San Cristobal to meet up with John and begin a week of exploring the big islands of Santa Cruz and Isabela. The islands are quite easy to travel - and surprisingly quiet. The vast majority of tourists spend their entire time in the islands on naturalist cruise ships with just a souvenir stop at the port in Santa Cruz. There is essentially no overlap between the sites accessible to backpackers and the cruise ship stops, so we had many locations basically to ourselves or just a handful of other backpackers. We started our journey with a couple days in the old town of 10,000ft Quito. Our only mission - don't get sick on local food before the dive trip. And yet we ate mystery meat on the street... We saw a bit of Quito's old town, hitched a ride with the Policia while walking down from the apparently truly unsafe Panecillo hill, and took a tram up to the top of the ridge overlooking all of Quito. While Mary was suffering a bit of altitude sickness on the first day, I visited Basilica del Vote Nacional which rates as one of my top climbs of all time. Not only do you get to climb to the tiptop of one of the clock towers, but you walk a plank over the main apse of the church to get to the spire. Awesome. We entered the Galapagos on San Cristobal island and had a half day to explore before boarding our dive boat, the Deep Blue. 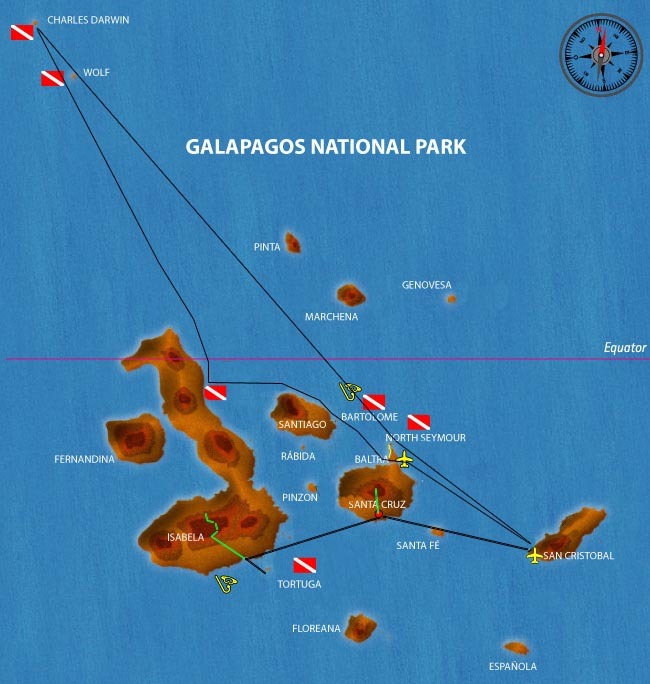 The Galapagos Parks system does a good job of segregating Dive and Naturalist cruises such that a dive boat basically can't spend any real time on land. The Deep Blue was allowed only four naturalist stops: a walk on North Seymore, a snorkel with sea lion pups at Cabo Marshall, a snorkel with penguins on Bartolome and a few hours on the lava of Santiago. But we're all about the big fish, so all this was icing on our cake. The MV Deep Blue was our home for a week of incredible diving. Generally speaking, we were pretty happy with the boat. One very good divemaster, one very bad. The other divers were a good mix - surprisingly not entirely American. The food was fine and the crew friendly. We'd dive the Deep Blue again. Just make sure you dive with Ruly. The main event of this whole trip was a week in search of 40' whale sharks and schools of hammerheads. We had an unbelievable time with 3 days at Darwin and Wolf Islands. The waters around these remote rocks were literally teeming with life. We nicknamed the area the Hammerhead Highway because there was a nonstop parade of schools numbering in the hundreds of sharks moving around the area. We caught at least a distant glimpse of a school on every dive at Darwin and Wolfe. On the more exciting dives, we had close encounters with scouts and even descended directly into the school on a couple occasions for full immersion in hammerhead heaven. It was truly incredible. We also had 17 whale shark encounters - 5 on a single dive! Water temperatures were a balmy 72F-74F in the north and as low as 69F in the central islands. Surface conditions and currents were not nearly as bad as we had expected. There were a few bouncy entries some air-sucking moments, but it was all quite manageable. Visibility was not great. Darwin and Wolfe were in the 25-50' range and murky. Most of the time, we'd see the hammerhead schools just at the edge of our clear visibility - taunting us to continue out into the blue. At Cabo Marshall on Isabela, we had 5-10' pea soup. Thanks to Dan and Holger for sharing photos after we flooded our underwater camera at Darwin. The main event of the whole trip was getting married in front of Darwin's Arch in the middle of the Pacific. We started the day with another round of amazing dives at Darwin and returned to find balloons and streamers all over the dive deck, galley and our room. After cleaning up a bit - Mary wouldn't let us get married in our wetsuits - we met the captain and new friends on the top deck of the boat. It was a beautiful day, the boat was parked just off Darwin's arch, and the captain was even in his dress whites. The captain performed the ceremony in Spanish, and then the bartender sealed the deal with a round of drinks for everyone. We thought we'd go back and translate the video of the ceremony to learn what we had agreed to, but the video was taken in underwater mode with the sound off! With the excitement of the diving behind us, we departed the Deep Blue back on San Cristobal and went searching for John, who had landed the day before. Our first solo day in the islands, we headed out to La Loberia to search for sea lions and marine iguanas. It's a quiet beach and a nice walk back to town. We managed to keep our stomaches intact on the 2 hour cruise between San Cristobal and Santa Cruz. We landed by 8am and had a big greasy hamburger breakfast at The Rock on the main strip to get our strength back and hunt for a place to stay. Puerto Ayora is a fairly large and busy town with an endless supply of white Toyota Hilux taxis running down the main street. The best part of town is the outdoor food street on Avenida Padre Julio Herrera. Familiar Williams encocado is the best. We did the typical tourists stops: Los Gemelos, lava tube, tortoise reserve, Bahia Tortuga, and Charles Darwin Research Center. For being the tourist hub of the islands, it's not such a bad spot. Isabela is another 2 hour crossing from Santa Cruz. We had calm seas again, but the captain had a bit of trouble getting our 20 person speed boat into port. He bottomed out in the shallow harbor and spent 10 minutes grinding back and forth to free us. Only funny because we could almost literally have walked in the remaining way. Our boat back to Santa Cruz a few days later faced similar challenges getting out of the Tintoreras shallows, but the captain as obviously experienced. He basically surfed the waves to push us through the sand bars with the motor out of the water. Puerto Villamil is surprisingly small and quiet after the busy ports on Santa Cruz and Cristobal. It has a much more laid back atmosphere, with the locals and tourists playing soccer together on the beach and eating in the same four restaurants in the town square. As soon as we landed back in Quito, we took an hour(!) taxi across town to the Southern bus station where we caught a ride to our new basecamp of Latacunga. The next morning, we took another bus to the town of Banos de Agua Santa. Banos is set in a lush forested valley below several volcanoes. A series of waterfalls along the river have made the area popular for cycling. We rented bikes and rode until dark - at which point we hopped a bus back home. At night, we followed the crowds in town to the main square where we got to see Ecuadoran President Correa parade by to cheers and fireworks. We made our way from Saquisili up to the 12000' volcanic crater lake of Quilotoa. After a cold night at the crater rim, we made a two day trek down through Chugchilan to Isinlivi. We did our best to get utterly lost at nearly every turn, and it made for great hiking. This is a beautiful area that seems to have endless hiking opportunities. The Black Sheep Inn in Chugchilan is a perfect home base to work from. We were lucky to get a room, as the President was in neighboring Sigchos and his ministers were spread out over the area. We woke up to find armed soldiers in the yoga room and had breakfast with the Minister of Defense.